This program is committed to providing support and tools in a judgment free atmosphere to help individuals quit tobacco. The four-week FREE course helps participants learn how to overcome nicotine addiction so they can enjoy the benefits of a healthier lifestyle. 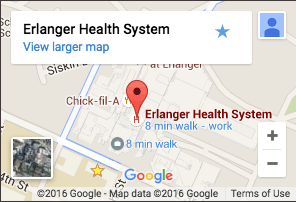 Erlanger Respiratory Therapist Navigators also offer COPD, asthma, and other disease management classes. Call for more information. The Tennessee Tobacco QuitLine is a toll-free telephone service that provides personalized support for Tennesseans who want to quit smoking or chewing tobacco. When you call the QuitLine you will be assigned your own quit coach and upon request a two week free supply of nicotine patches will be provide if medically approved. Your quit coach will help you understand how to quit tobacco and help you develop a plan that works for you. The plan will fit your needs, and you have the same quit coach for a year. The services provided by the QuitLine are free of charge to all residents of Tennessee. The telephone number is 1-800-QUIT-NOW and the website is health.state.tn.us/tobaccoquitline.shtml. The QuitLine is available Monday through Friday, 8AM – 11PM, Saturday 9AM – 6PM, and Sunday 11AM – 5PM. American Lung Association: The Freedom from Smoking free online program takes you through modules that you access on a protected website. These modules include valuable information, and most of them contain an assignment that you are to complete before moving on to the next module. Assignments reinforce the messages in each lesson and your commitment to quit. The basic modules are free and can be accessed day or night, seven days a week. The website is www.ffsonline.org. The American Lung Association also has a help line that is staffed by certified counselors who are registered nurses and respiratory therapists. The number is 1-800-548-8252. The American Cancer Society has a downloadable guide with information about smoking and how to quit. The website is www.cancer.org.